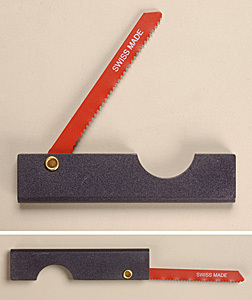 The Escape Saw can be a vital piece of gear that should be in every adventurers survival kit. This small, discreet, and lightweight cutter could be just the tool you need to extract yourself from an undesirable situation. It can cut metal, wood, plastic, rope, etc. It cuts on the pull stroke. Saw length: 2.25". Closed size: 3.25" x 0.625" x 0.375". Weight: 0.4 oz. Color: black.